Paint nights are all the rage right now. What started out as a random event, moving from town to town, has become a staple for the girls’ night out, date nights, fundraisers and anyone simply looking to have fun. 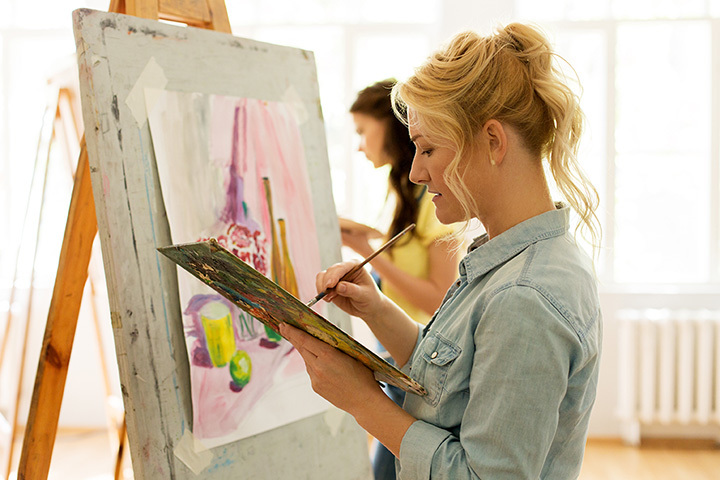 In Maryland, there are several studios that you can visit on a weekly basis to unleash your inner artists. Here are the 10 best. Seven days a week you can pop into Muse with your friends, learn to paint and enjoy a glass of wine. It’s the perfect night out and way to relax without needing to plan ahead. They even have nights where you can get a free drink so check out their calendar for regular updates. Many of the venues hosting paint nights change on a regular basis. With the Painted Palette, you can visit the same location year after year with your friends and even learn from the same artists. This is a fabulous art studio with classes for people of all ages and the fact you can have a glass of wine while learning is simply an added bonus. With their own location, Tickled Paint really explores fun and new ideas for paint nights. You can easily relax here and unwind with friends while learning to paint and enjoying a beer or glass of wine. For those who want a stress-free way to learn, this is your opportunity and you don’t need to leave the Eastern Shore to do it. They also have a mobile unit if you want to bring the party to your house instead. St. Mary’s County Wine & Design did not start because of this fun national trend. Instead, local artists, wine lovers, and the community decided to come together to have a good time. Local artists are on hand, paint is plentiful and wine is flowing. They even have a studio space for kids so you can come here with your girlfriends or host your child’s next birthday party. It’s the perfect local venue to have a great time. Maybe wine isn’t your thing. Maybe you would prefer a beer or a cocktail instead… no problem. With Pub & Paint, you can learn to paint at a local Baltimore pub and have a great time doing it. These events tend to attract just a many men as women and the venue is constantly changing so it is easy to find the right place to have a few drinks and explore your inner Picasso. This is Ocean City’s answer to a paint & wine night hosted by a known art studio. Beachfront living lends to creativity anyway. To have fabulous local artists lead painting classes is a treat and the perfect way to complete your beachside vacation. Kids are welcome or if you prefer, you can have them host a private party at a location of your choosing. Check their events calendar to find out when a Wonderfully Made 4 You paint & wine night will be in your area. They are all over Maryland which makes it easy for you to find something close by. The cool thing about this company is that they do more than paint on canvas. For example, you can learn how to paint on wine glasses. Learning to paint at the hand of an artist fantastic enough to be featured at the Kennedy Center and Smithsonian makes this far more than your average paint night out. The painting workshops at The Faux School are something to behold and as someone who already has some experience with painting, it can be a fantastic experience. View their calendar of events and book your tickets early. This is mostly a pottery studio where you can drop in at any time to paint something special. On a regular basis, they also hosts sip-n-paint nights with different themes. For example, they recently held one where everyone painted the Maryland flag. Another one featured a summer or tiger theme. Find your favorite and book your tickets online. This art studio is open year-round and you can drop in any time to explore canvas and pottery. As an emerging artist or someone looking for a fun night out, they provide plenty of opportunities to come and explore your creative side. On their calendar of events you will find paint & wine nights and happy hours. Check frequently since they are always adding new events.